Posted on 2017-05-04 at 23:48 in Programs by Robbi-985. What error are you getting, and from what program, and what does it say? I am facing the same problem. 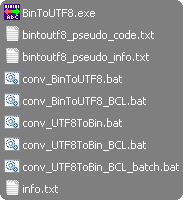 The getting UTF from t7 goes through , running it through your utftobin conversion. The final binary file is 10kb (when the length is 100000) and it does not produce any sound. ——————————————————— (i) ———————————————————- [Done with errors] Done (2 / 10,402 failed) Press any key to continue . . .
Any idea what could make so many failed results? Oh, don’t worry about that message! That’s just due to a final carriage return and line feed (2 characters) added to the end of the text by Torch-rnn “print”ing the text out to StdOut (as it’s expecting the text to be displayed on a console, and wants any following text to be on a new line). BinToUTF8 doesn’t use those 2 particular characters in its conversion (to avoid cases like this from messing up the conversion), so this message is expected behaviour – that’s why I made it display the number of failed character conversions too, so you can see whether it’s a real problem (thousands failed) or not. It simply ignores those two characters and should produce an output of exactly 10,400 bytes (instead of 10,402 bytes). I assume the silence is due to the training data, though – Torch-rnn output 10,400 recognised characters, which got converted back into silence, but I can’t tell why Torch-rnn predicted silence. To confirm, you could look at the actual text output by Torch-rnn and see if it’s the same character (or handful of characters, all around the waveform centre) throughout. How do you convert the .bin back to .wav? Do you just change the extension? I have converted my .wav (11khz 8 bit u law) into the .txt using your program. Trained it, obtained another .txt and then loaded it back to your program which generated .bin. When I changed the extension to .wav it didn’t open.